Canned vs Dry vs Gran Free: What Is the Best Puppy Food? 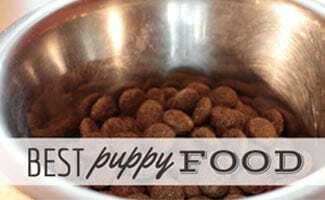 Home > Training > Puppy > Canned vs Dry vs Grain Free: What Is The Best Puppy Food? If we asked you where your pup’s food is made or what some of the key ingredients are, would you know? We focus so much on what we put in our bodies that we sometimes forget how important it is to nourish our furry friends with the best food for puppies. 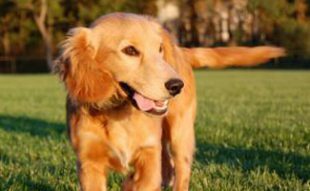 The American Association of Feed Control Officers (AAFCO) sets the nutritional requirements for puppies. 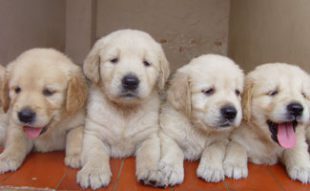 On a daily basis, puppies need 21% to 22.5% protein, 8% to 8.5% fat and a maximum of 4% fiber. So the healthiest puppy food should have this mix. We chose the best puppy food according to type and dog size. We also pick the best for each category: canned, dry and grain free puppy dog food. And on top of that, ALL of these fit the “natural puppy food” classification, so you know you’re giving your pup a good meal. Whether you want to treat your dog to a topping on her dry dog food or give her wet food only, Wellness puppy food is a great solution and one of the most popular puppy food brands. This Wellness dog food can be given to your dog when your dog is a pup, and you can transition her to adult, and later to senior dog food as they age. It is available in different flavors too, so that you can add variety to your dog’s diet. The canned puppy food has 9% protein, 7% fat and 1% fiber. This puppy pate’s main ingredients include chicken, salmon, sweet potatoes, carrots, apples, pears and more. Looking for some dry puppy food for your dog’s size? 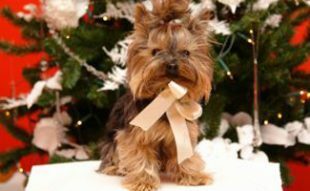 Check out our top picks for small, medium and large breeds below. This Natural Balance dog food was made especially for smaller breeds for ages puppy to adult. Customers rave about how much their pups love this kibble. This puppy chow has 23% protein, 13% fat and 3% fiber. Some key ingredients are chicken, brown rice, oats, potatoes and carrots. This Taste of the Wild dog food is great for your medium size breed puppy. This grain-free dog food has 28% protein, 17% fat and up to 5% fiber. Some key ingredients include buffalo, lamb meal, sweet potatoes, beef, tomatoes and blueberries. The combination of fruits, vegetables and meats helps provide a well-rounded diet for your dog. We sifted through some large breed puppy food reviews and found Holistic Select to have the best. This kibble includes probiotics, healthy fiber, digestive enzymes and more to help your pup feel her best from the inside out. This large breed puppy food has 23% protein, 12% fat and 3.5% fiber. Some key ingredients include apples, beef, blueberries, chicken, lamb, potatoes, pumpkin and tomatoes. If your pup needs a grain free diet, this Orijen puppy food is what we recommend. Customers know that this is a higher priced dog food but say it’s worth every penny. Pet parents are pleased with their dog’s bowels, lack of gas and overall puppy health. It is made up of 85% poultry, fish and egg and 15% fruits, vegetables and botanicals. This kibble is 38% protein, 20% fat and 6% fiber. Remember to be patient with your pup. Like anything, trying something new the first time is never easy. Your dog may make a mess or need to try it a couple of times to get the hang of eating kibble, but they’ll eventually pick it up. 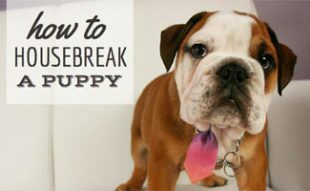 If you have a new dog, be sure to check out additional reading in our puppy-related articles including a new puppy checklist, how much exercise puppies need, how to puppy-proof your house and more! What’s your puppy’s go-to food? I am feeding my 4year old chow chow Hachiko special dog… Do you think he gets the nutrients he needs? What if my dog is a mixed breed? How do I know how big it will get so that I could get the right food for my dog? Normally, when we don’t let our puppy out, we let him stay in the crate outside the house. But what I want to know is should the food bowl be left inside the crate with the dog always refilling when empty or only give him a full food bowl before playtime? It would be great to add other brands such as wellness, merrick, blue buffalo, etc. As well as other wet food specifically for puppies. I have a six month old pug and agree that the Natural Balance food is the way to go for dry food, she gobbles that stuff up and we tried a few other brands she didn’t like as much.